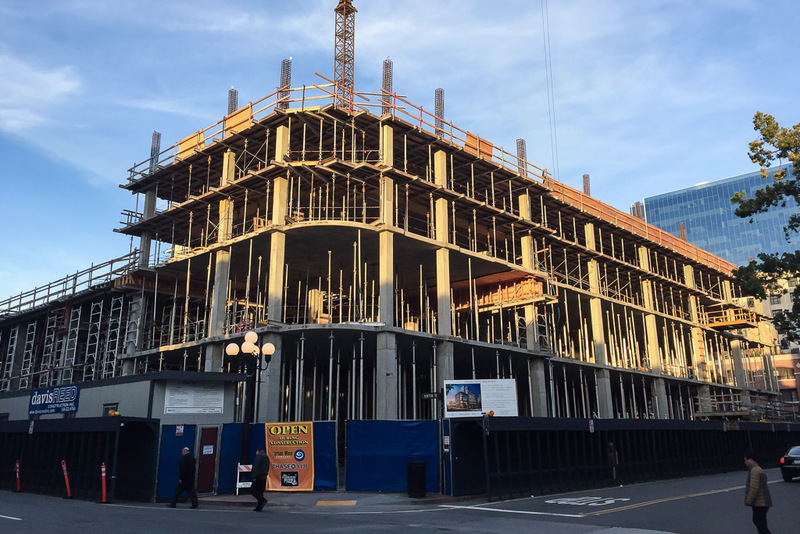 On a stroll through the Gaslamp Quarter this week, we checked on the latest progress at the new Pendry Hotel currently under construction at Fifth and J. 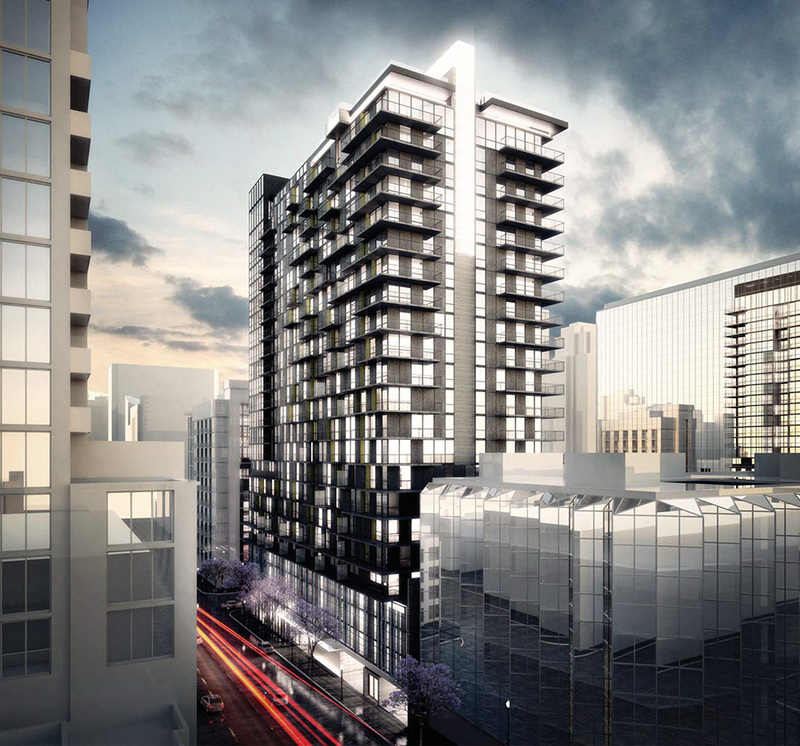 Developed by the Robert Green Company, the 12-story, 317-room hotel will be managed by Montage Hotels & Resorts. Montage currently operates five luxury hotels in destinations like Beverly Hills and Laguna Beach. This will be the first of the company’s new Pendry brand, which promises first-class amenities and unique nightlife under one roof. When construction began more than a year ago on the property, it was expected to be completed by August 2016. At this rate, we think it’ll take a little longer than that. Nonetheless, it’s great to see a high-end project rising on what mostly used to be a surface parking lot. 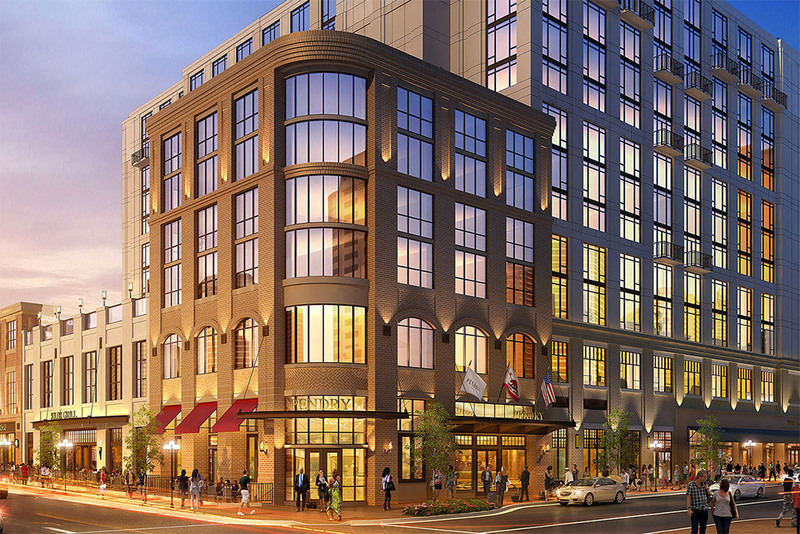 A rooftop pool deck along Fifth Avenue will offer views of the vibrant Gaslamp below. Plans also include two “uniquely-designed” restaurants, a beer hall featuring local brews, and an underground nightclub. Yeah, you’ve got our attention. That blurb may have been about Hillcrest if this were a few years ago (it’s closer, after all), but times have changed. On a related note, developer Robert Green announced a proposal on Friday for a much larger, 831-room hotel on the bay-side of the San Diego Convention Center. 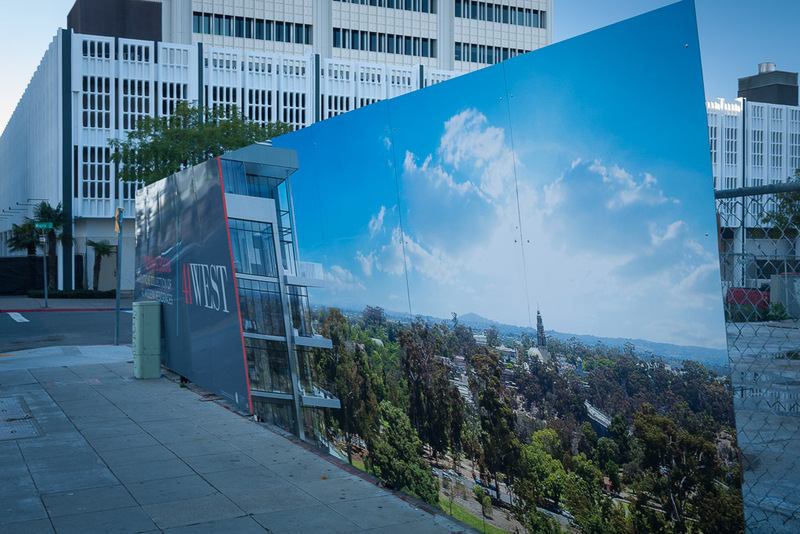 The San Diego Union-Tribune has more details on that 45-story, $270 million project. 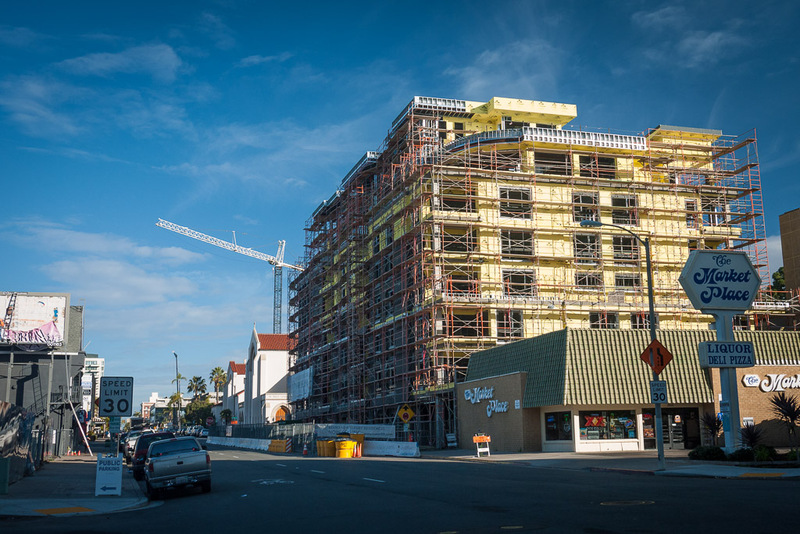 With several projects underway and more planned over the next few years, Bankers Hill has become a hotspot for new residential construction. Returning once again from a long hiatus, we checked up on a few new buildings in the neighborhood. 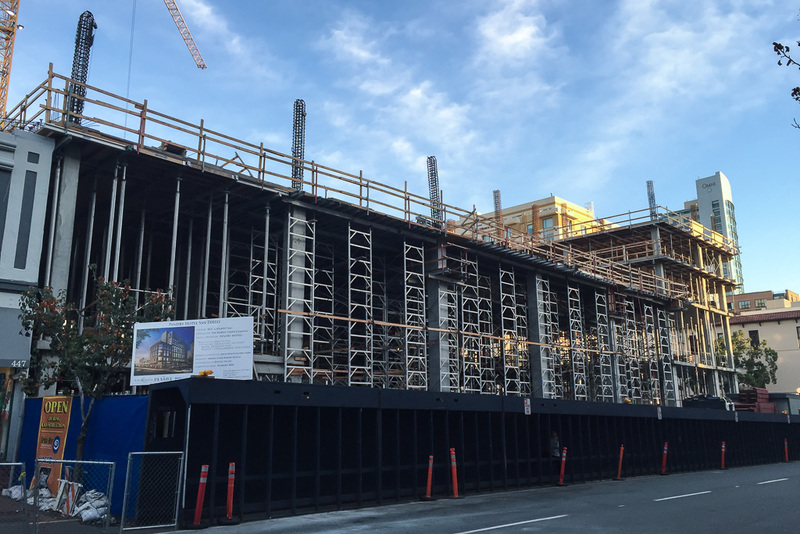 Construction began more than a year ago on Vue on 5th, the seven-story condo building going up at Fifth and Nutmeg. We’re only just now realizing how massive it is, as work finally nears completion. We’re still not sold on the bland design, but we’ll see how the exterior finishes turn out. Three commercial spaces are planned for the ground level, but we haven’t heard any word on early tenants. Plans call for a modern design consisting of glass, painted concrete, and metal. After initial feedback from Uptown Planners, the project was revised to move its 75 parking spaces underground. 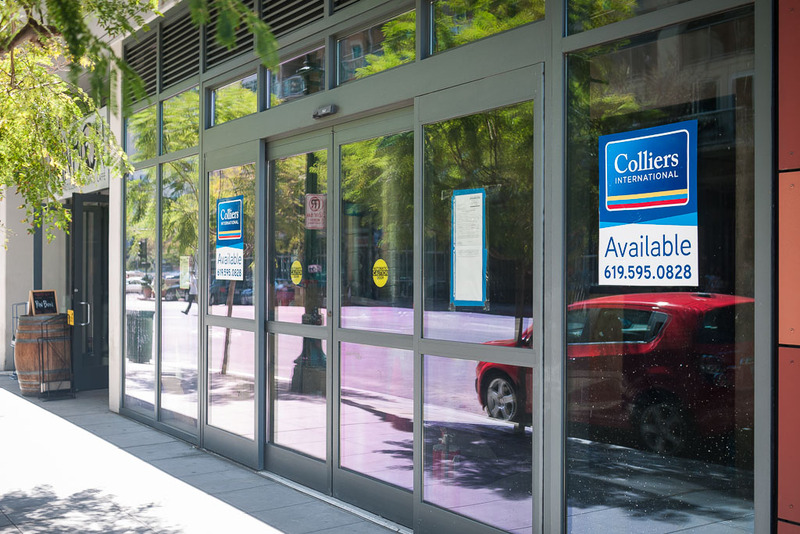 It previously also included no retail space, but will now include a small, 1,400-foot commercial space on the corner. 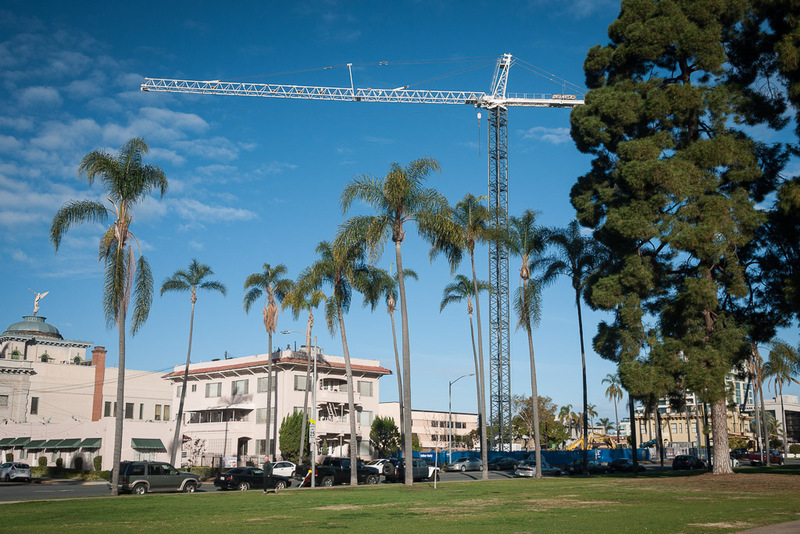 A few blocks north, a crane is now up for what will become The Park at Bankers Hill. This is the site of the old Sixth Avenue Medical Center, which was demolished over the summer to make way for the ultra-luxury condo building. 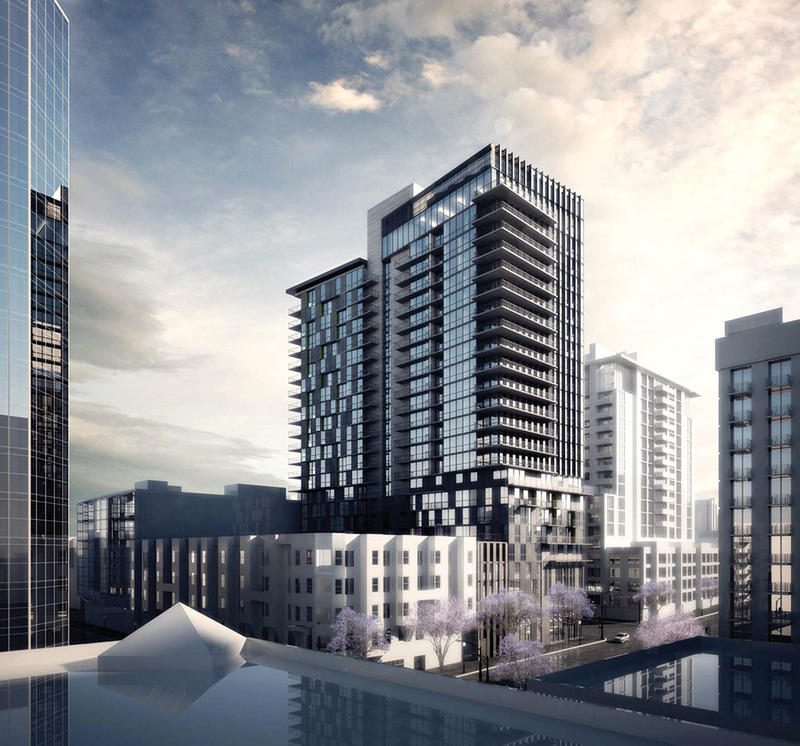 The project includes a 13-story tower, along with a set of townhomes along Sixth Avenue. The folks behind this one have made it clear that this building won’t be for just anyone. 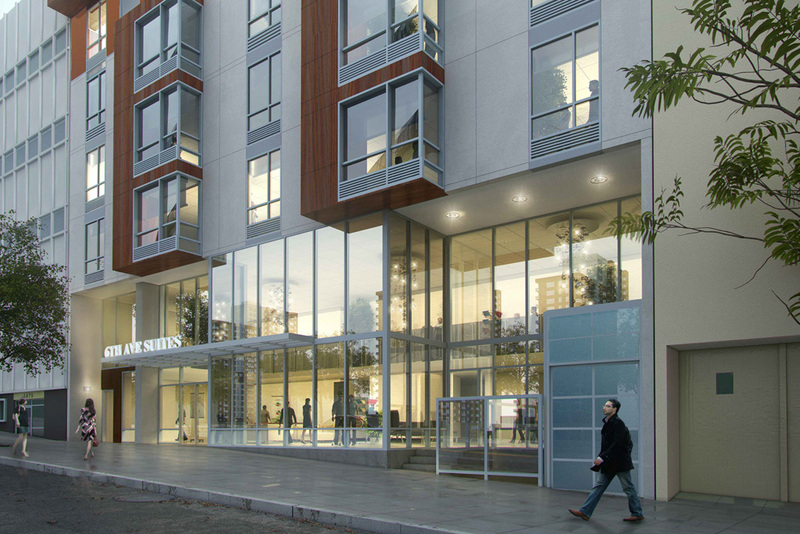 Units will start at $1.5 million. You can check out all the floorplans on their website, but what’s even more interesting is the timelapse footage of the construction. 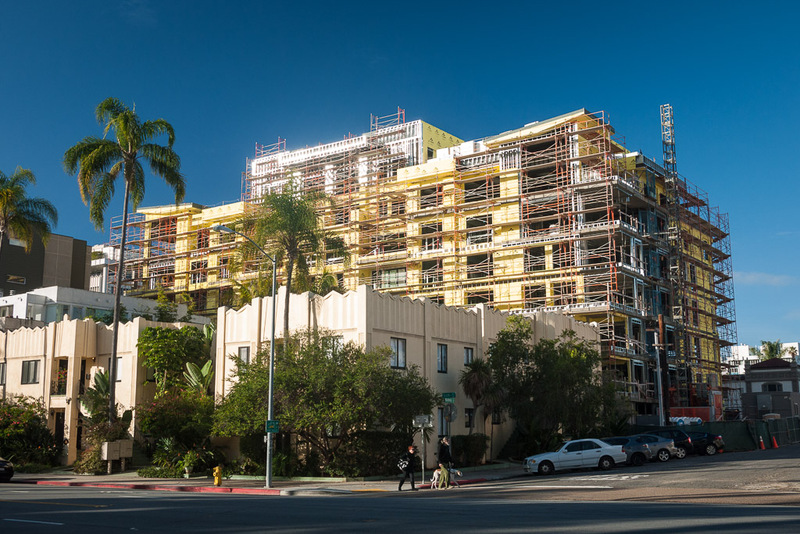 Finally, construction continues on the 49-unit Fourth Avenue Lofts building at Fourth and Palm. 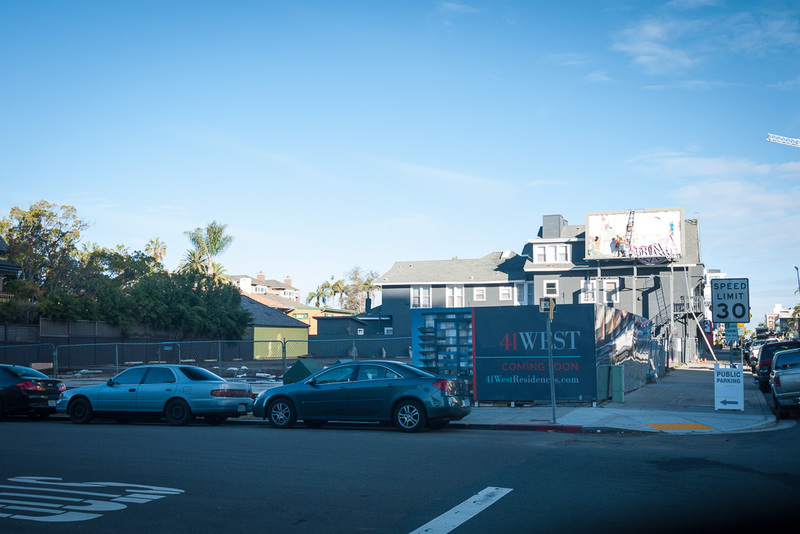 The project is the latest from Lloyd Russel, the developer responsible for other area projects like Centre Street Lofts in Hillcrest and Essex Lofts in Little Italy. Four commercial spaces are planned for the ground level. 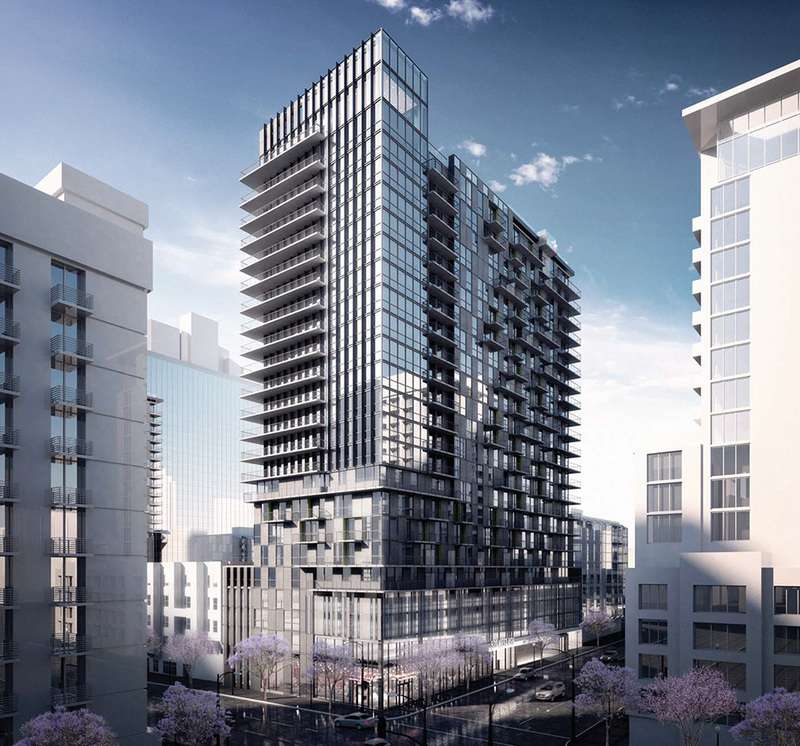 A 24-story mixed-use tower has been proposed for the northwest corner of Columbia and Ash in Little Italy. 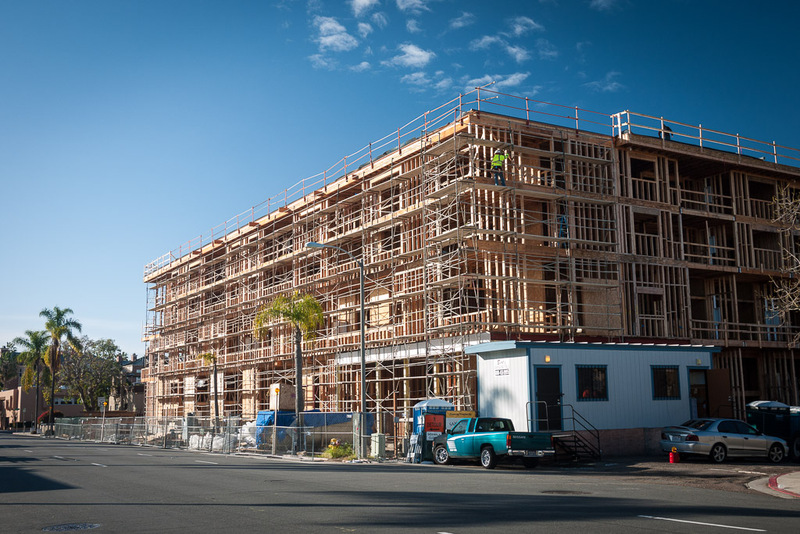 Civic San Diego received the proposal earlier this month from Lennar Multifamily Communities. The building would include five levels of underground parking, 4,943 square feet of commercial space at ground level, three additional levels of above-ground parking, and 19 levels of residential units. A rooftop common area would feature a pool and outdoor space for residents. The project site is located at 520 W. Ash Street, where a three-story office building currently stands. The 266-foot-tall development would also replace the Crossfit Invictus building located at 1446 Columbia Street. Exterior elevations show a facade consisting of glass, exposed concrete, and painted metal panels. 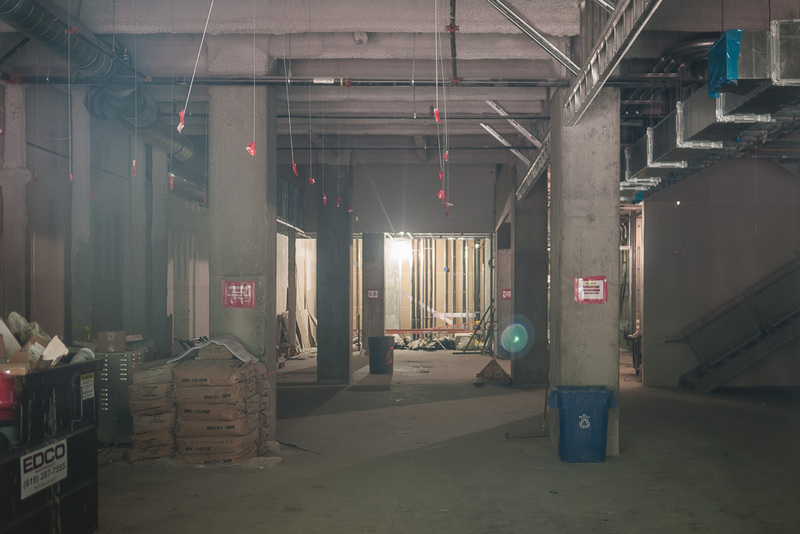 The building design comes from Carrier Johnson + Culture, whose other Downtown projects include the new Sempra Energy Headquarters and the upcoming Ballpark Village. This is probably one of the most walkable locations in all of Downtown—just a few steps away from the heart of Little Italy, and a short walk to the Marina and Gaslamp Districts. Notice the brightly-lit lantern feature going up the side of the tower, as well as the pop-out spa hanging over the edge of the common area on the roof. 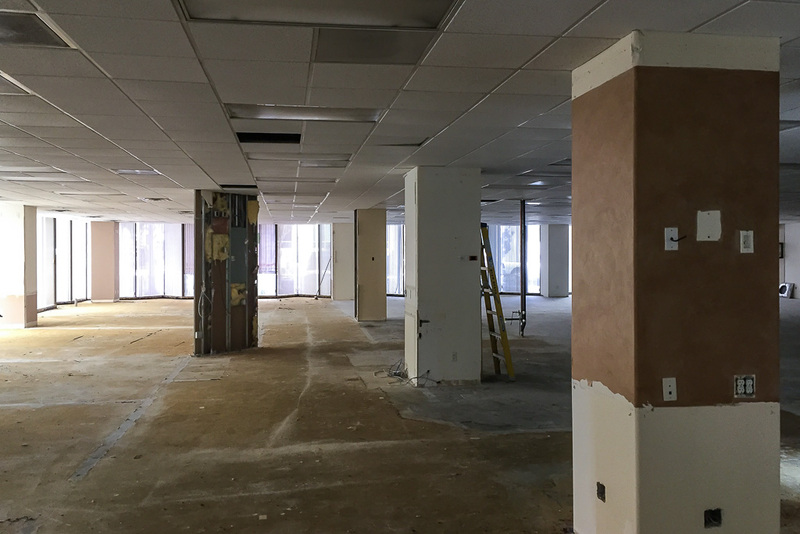 The project timeline is currently unknown, but we’ll be sure to keep an eye on the progress. 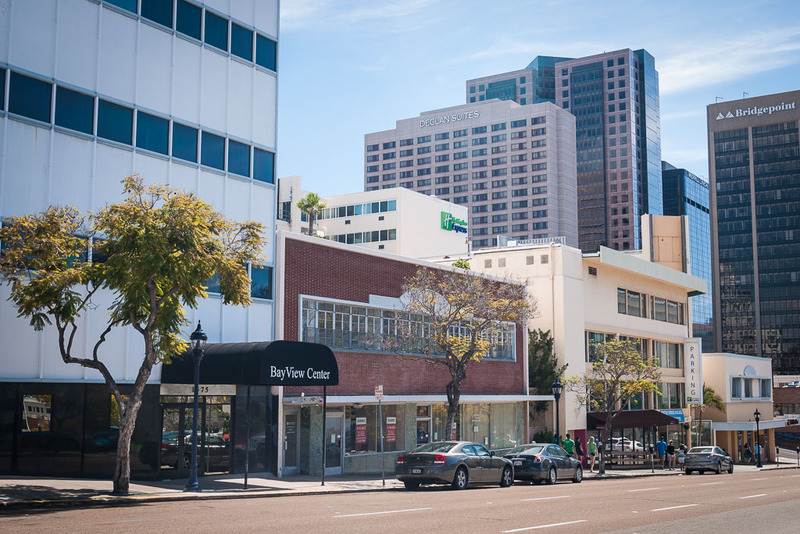 Last month, we told you that Civic San Diego was planning to review a proposal for a hotel project in Downtown’s Cortez Hill neighborhood. 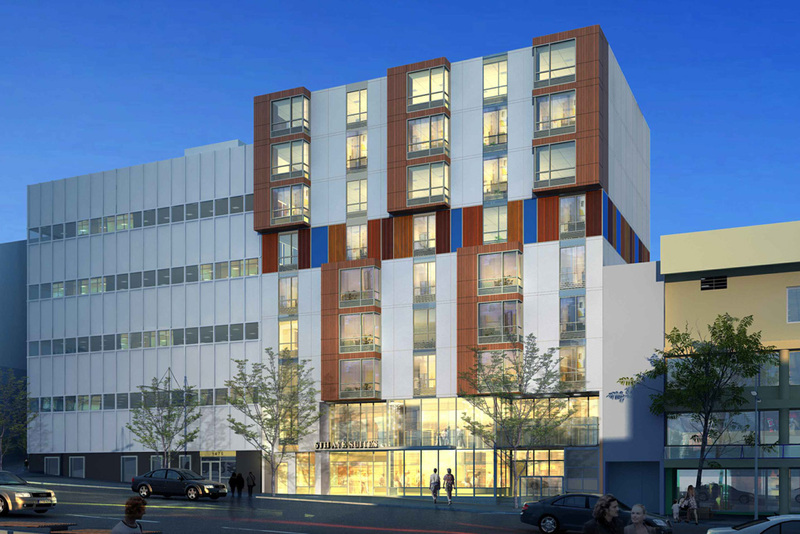 Sixth Avenue Suites—a nine-story, 98-suite hotel—would be built on a small, 7,500-square-foot parcel located on Sixth Avenue between Ash and Beech. Now, we’re getting our first look at renderings of the proposed hotel. The exterior is a blend of browns and blues, with oriel windows giving the building some depth. Plans include a two-story glass atrium for the ground floor. Common areas feature an open lobby and lounge, as well as a grab-and-go food bar, breakfast room, and two small courtyards for guests. With a limited street frontage of only 75 feet, it makes sense that they decided to skip a parking garage entrance. Instead, the operator will have an agreement with the existing parking garage next door. The design comes from San Diego firm Joseph Wong Design Associates. That’s the same group responsible for other Downtown hotel projects like the Hilton San Diego Bayfront, as well as the upcoming Lane Field. Located at 1441 Sixth Avenue, Sixth Avenue Suites will replace the office building shown above with the brick facade. 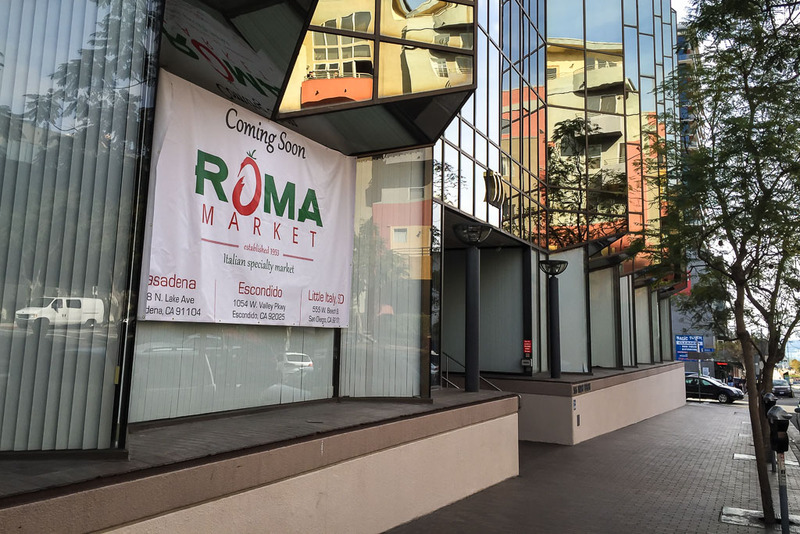 A new Italian specialty market is in the works for Little Italy. 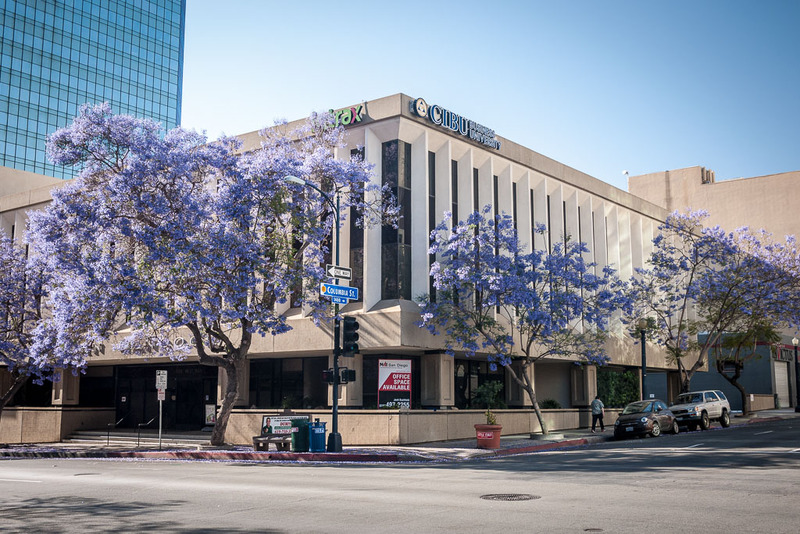 Pasadena-based Roma Market recently announced plans to take over the first-floor corner of an office building at Columbia and West Beech. The family behind Roma Market opened the original location in Alhambra in the 1950s before later relocating the store to Pasadena. Just last month, Roma Market kicked off its San Diego expansion with the grand opening of a new Escondido store. The neighborhood market offers wines and pastas imported from Italy, as well as homemade breads, sauces, and meatballs. A cafe at the Escondido location serves hot and cold sandwiches, as well as salads and pizzas made with house-made dough. You can expect a similar setup at the Little Italy location. 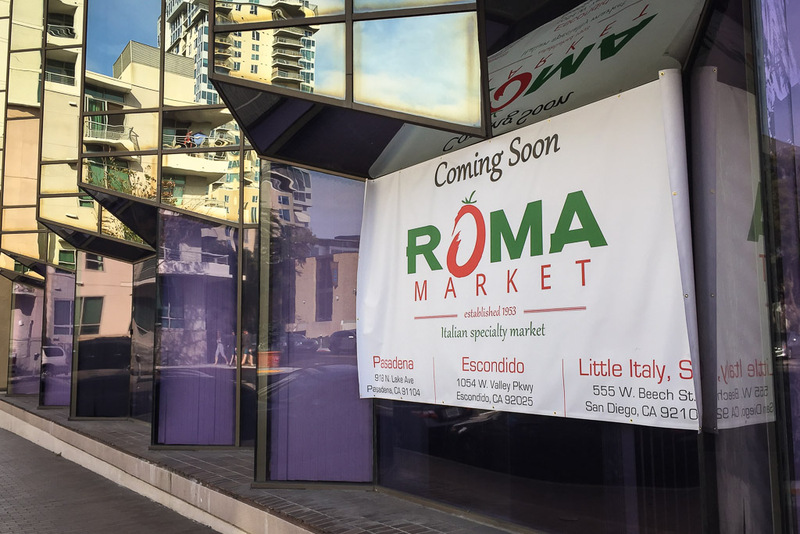 Eater San Diego reported last month that the Little Italy market isn’t likely to open until next year, but that construction should begin soon. They plan to open up the glass and add a large outdoor patio. Just two blocks west on Kettner Blvd, we had to check in on the long-delayed Hanson’s Market. If you’ve wondered what’s taking so long on the natural and organic grocery store, you’re not alone. After several questions from curious folks on Facebook, Hanson’s replied last month to say that permits are taking longer than expected. No kidding. 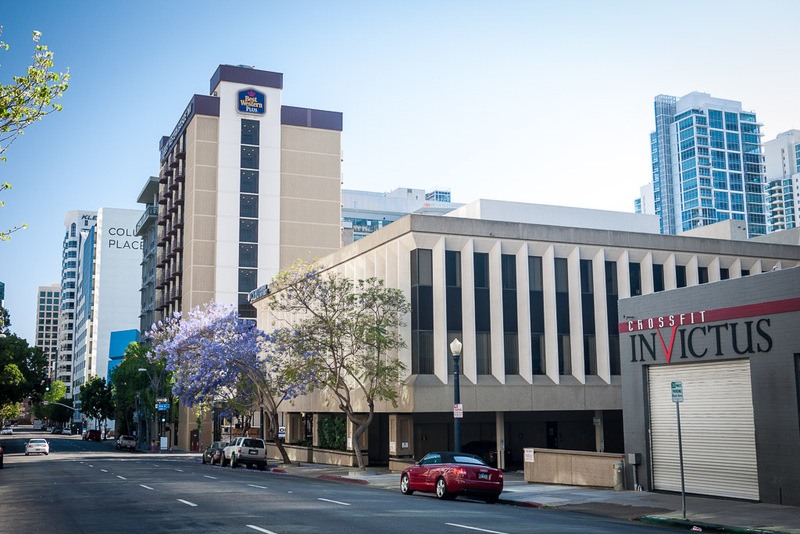 Little has changed inside the Hanson’s Market space, which is located on the first floor of the new Ariel Suites tower at Kettner and West Beech. Some residents have questioned the “available” signs posted out front, which we also think is a little odd with the “coming soon” banner hanging above. All these months later, we’re still not sure what’s going on with Hanson’s. 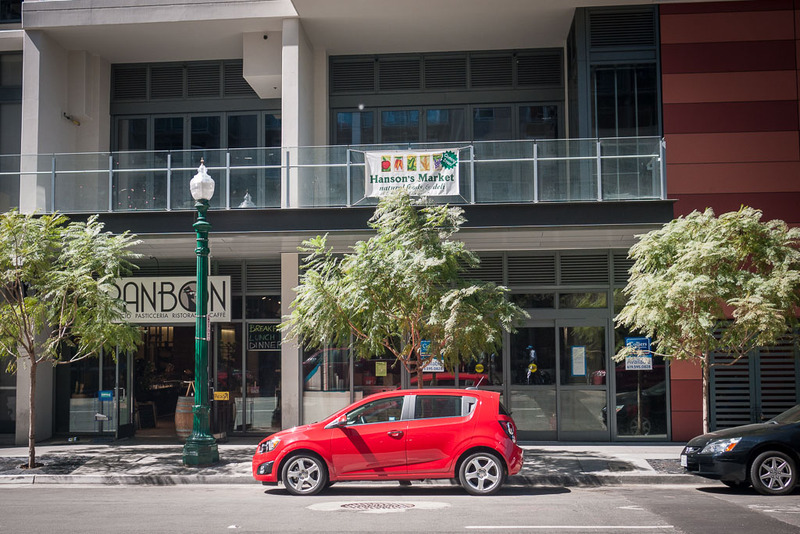 @sandiegostreets – sadly, @HansonsMarket isn’t coming to Little Italy anymore. The leasing agent confirmed it to a neighbor. You’ve arrived at San Diego’s newest neighborhood blog, San Diego Streets. Our mission is to keep you updated on what's new and coming soon in America's Finest City, with a focus on the urban neighborhoods around Balboa Park.